With access to more information and many ways to buy, consumers have become fickle, and retailers are reeling from the backlash. Loyalty programs are now the norm, and memberships in these programs continue to increase. But retailers struggle with finding the right mix of valued program awards for their customers, and they are challenged to differentiate their programs from those of their competitors. 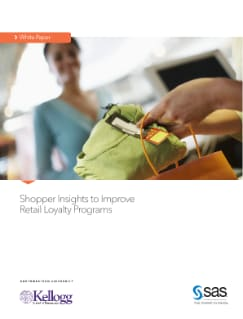 This exclusive paper provides insight into the customer's perspective of retail loyalty and how to structure rewards to three distinct types of shoppers. What benefits matter most to consumers with respect to retail loyalty? Can shoppers be segmented into relevant groups based on their actions and behavior? How and why do shoppers interact with retailers on social media? Who are the retail industry role models in loyalty, according to shoppers?